The newest generation of the LZ30p, LZ30x and LZ30z are the state-of-the-art in Class 3b cold laser technology. These FDA cleared cold lasers provide an unparalleled balance of features and totally crushes the competition when compared to other class 3b models like Thor™, Microlight™ and the Erchonia™. With the Avant Class 3b lasers, you get more power, more flexibility, and a longer warranty for less than any competing lasers. The LZ30 lasers have up to 15 times the power of the ML830™ AND up to 200 times the power level of an Erchonia™ laser system. This means you can either shorten your treatment times by 15X (by targeting the same dosage) or give your patients the higher dosage that often makes the difference between success and failure. The LZ30 series are the only self-calibrating cold laser with automatic power control that sells for less than $6500 (Medilaser). The LZ30p, LZ30x and LZ30z come with a web-app therapy timer with over 200 dynamically created precision protocols for humans, horses and dogs. This LZ30z is one of the most powerful class 3b IR (808nm) laser on the market and it is the most power FDA cleared RED (637nm) laser available at any price. When you combine these great spec with a 3-year warranty and training from a doctor over the phone (included with every system), you are getting maximum flexibility and some of the best support in the industry. Professionals can get a 30-day money back guarantee on any LZ30. *Avant systems include training and long-term support over the phone. Pro users have a much higher support requirements so they will not sell their lowest cost laser (LZ30p) to professional. They also want doctors to have more power so they can can get consistently great results without long treatment times that might disrupt their practice. The treatment times on the LZ30x and LZ30z average 8 - 12 minutes. The LZ30p treatment times are up to 40% longer. All 3 LZ30 systems include free shipping, water-resistant case, 2 pair safetly glasses, charger, probe adapter, USB cable, web app & training/support over the phone. 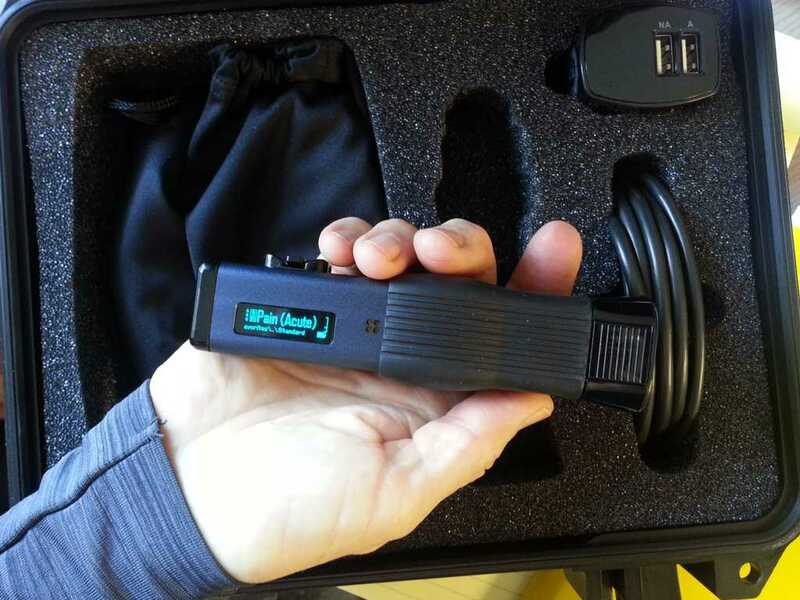 The LZ30 lasers come from the factory with internal pulsing presets to address 90% of the conditions that most people would treat with a laser, but it also allows for total customization of every variable using a micro-joy-stick controller on the top of the device or using the standard USB interface. New users can easily step through presets, favorites, and advanced features using the micro-joy-stick controller. For advanced users, the device allows the creation and maintenance of a set of favorites (presets for treating special problems). The LZ30 allows users to choose from continuous, pulsed and sweep operation with power levels up to 1400mW at 808nm (infrared) and up to 100mW at 637nm (red). 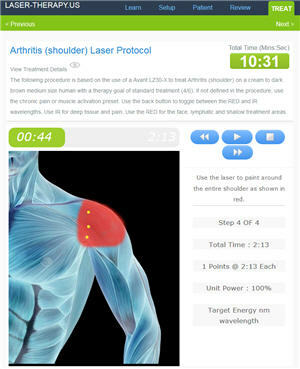 This allows practitioners and users the same level of control as many of the most expensive cold lasers on the market. Every LZ30 system also comes with a web app (image at the left) that can run on a computer, tablet or phone. The website application creates step-by-step custom therapy plans for over 250 conditions for humans, pets and horses. 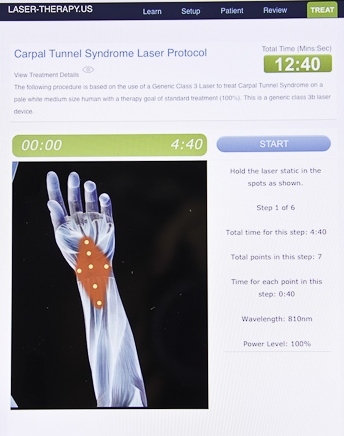 The system includes a therapy timer to tell users exactly where to use the laser and how long to hold it there for the best results. The "cookbook" protocols take all the stress and guesswork out of finding the optimum energy target for a variety of conditions. This system also includes support from Dr Rick Amy, the clinical support specialist for Avant. This industrial design includes an aluminum anodized body with a soft rubber grip to make the product easy to control. The device is solidly built and perfectly balanced so it feels good in your hand. The compact size (just 1 inch x 1 inch x 4-1/2 inches) makes it easy to transport and use on any part of the body. No other cold laser on the market packs this level of power and control into such a compact size. You can also use the Avant Laser with a stand for hands-free or unattended therapy. Just set up the laser and then drop it into the cradle. The laser slides right in. You can use the adjustments on the mount to set the angle and treatment size before you lock it down. The laser easily pops in and out of the stand for multi-step treatments. If you place the laser about 2 feet way from the treatment area, the laser will treat a 9-inch-by-9-inch area. This means that you can deliver over 1000 joules (CW Infrared mode) into a lower back or other similar area in about 12 minutes while you attend to other patients. All LZ30 products can be used with the included light pipe (probe adapter) for trigger point and acupoint therapy. Here is a comparison chart of the 3 different models. * Home users typically treat just a few different conditions so they require a lower level of long term support when compared to doctor's who are constantly finding new applications for the laser. Home users may buy an p, x or z. Use the factory defined presets or develop your own protocols. The device has enough onboard memory to store hundreds of protocols. Self-Calibration: An internal feedback mechanism ensures that the laser is providing a consistent power output. This is a feature usually only seen on the most expensive cold lasers. Maximum flexibility using the included USB cable. Create and maintain your favorites and presets on your PC by mounting your LZ30 as a USB drive on your PC. It includes a 3-year warranty. Nobody beats Avant and ColdLasers.Org for customer support. We will beat anyone's price on this product and we offer better support than anyone. Standard delivery is 3-4 days. Safety lockout Yes, keycode required to start unit. Yes, keycode required to start unit. Yes, keycode required to start unit. Battery Capacity One week when using the red lasers, 4 hours when using infrared at maximum output. One week when using the red lasers, 4 hours when using infrared at maximum output. One week when using the red lasers, 4 hours when using infrared at maximum output. The LZ30 series of lasers do not use inexpensive laser diodes, SLDs or LEDs. Cheaper LEDs do not offer the same level of power control that you get from using high-end InGaAlP diodes. All the Avant products use the highest quality laser diodes, and they are self-calibrating so that as the diodes age and the output decreases, this system adjust the input power up so that you can same power output year after year. The LZ30 products also include a broad treatment area. Using advanced optics, the product allows users to treat area up to 1 inch by 1 inch without moving the device. For practitioners, the larger treatment area means faster treatment times. For beginning users, the broad treatment area means that users are more likely to hit the "sweet spot" when treating a poorly defined problem area. * The Infra Red wavelength is better for deep therapy and the visible red is better for superficial or systemic therapy. Before this product was released in 2013, it was sometimes called a TheraLazr. We Are the Only "Brick and Mortar" Laser Store in the U.S.
Visit Us at 921 Main Street in Louisville, CO. We are no "here-today-gone-tomorrow" laser store, we are the biggest and best laser specialty store in the US. We will do everything in our power to make sure you get unbiased advice, the best training and the best service support. When you buy from ColdLasers.Org, you don't have to guess how to use your new laser. 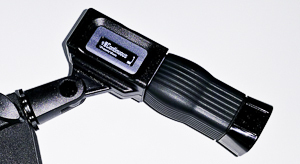 Every new laser comes with the Laser-Therapy.US Therapy Tool. 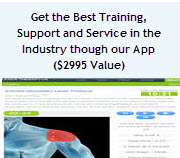 This system dynamically creates pictorial treatment plans for over 250 different pain/inflammation/bloodflow related conditions for humans, pets and horses based on real world patient factors. Pros get a 30-day 100% money back guarantee on any system. Home users get a 30-day guarantee but pay a 15% restocking fee. With any Pro system over $5000, we will create custom marketing literature for your business and send you the original artwork including flyers, pamphlets and posters. Since 2002, we have supported over 10,000 customers and maintained a 5-Star rating. You can trust ColdLasers.Org. As a top-rated BBB business, ColdLasers.Org has established itself as "The Trusted Name In Cold Lasers". ColdLasers.Org will meet or beat any competitive price on any cold laser and we will give you better support and training. Just give us a call for more information. 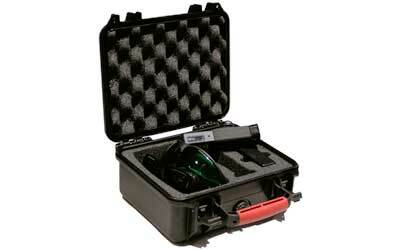 Every cold laser system we sell includes free shipping to anywhere in the US and Canada. We also accept checks, wire transfers, Bitcoin, Ether, LiteCoin and Dash. We work with many different financing companies who focus on financing for professional. We can help you get rates as low as 5%. Your Transaction is Secure because it is processed using RapidSSL 128-bit encryption and Quicken. We don't keep any personal credit information on our system. 5 + 4 =* This math problems stops most spam. Copyright 2019 ColdLasers.Org | Sitemap | Terms Of Service ColdLasers.Org sells cold laser systems and accessories. We have aggregated information from many manufacturer to help consumers learn about all their options. This information is for reference only and is not medical advice. The information provided through this web site should not be used for diagnosing or treating a health problem or disease. If you have or suspect you may have a health problem, you should consult your local health care provider.